Argggghhhhh! The words alone strike terror into the heart of any newbie Kombucha brewer. Yet this fear is mostly unfounded as Kombucha mold is extremely rare. 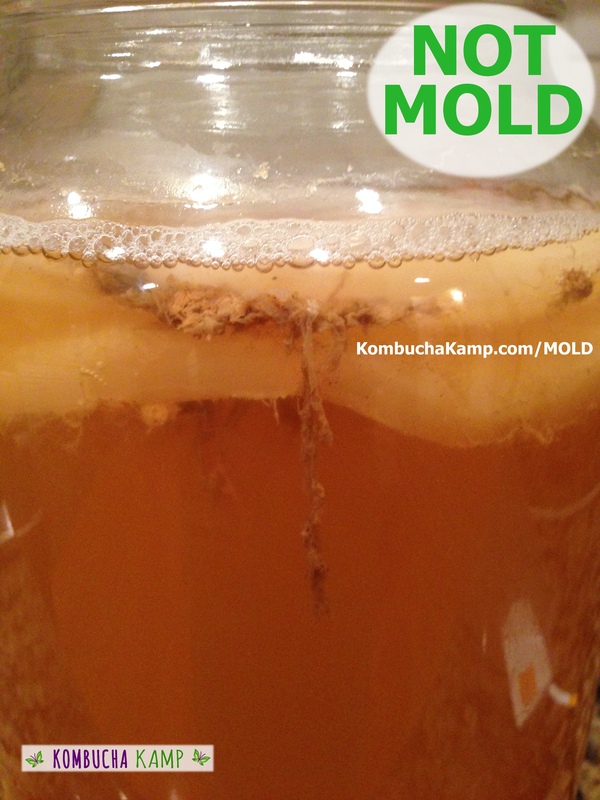 In many years of brewing, we RARELY EVER encounter a batch of moldy Kombucha. It is always plainly obvious if one is looking and, yes, disheartening for a moment. Nobody likes to fail and the sight of fuzz on the brew is often intimidating for a moment. Yeck. 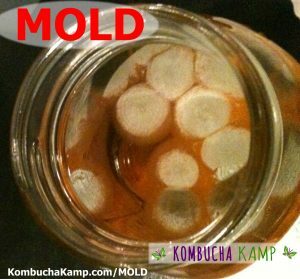 NEVER ATTEMPT TO SALVAGE A MOLDY KOMBUCHA CULTURE. If you have determined it is contaminated, THROW IT AWAY, along with whatever other cultures and liquid are present in that jar or vessel. 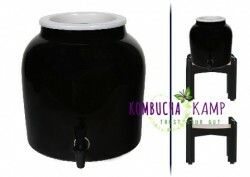 Start over with a new one, and try the tips at the end of the article to avoid Kombucha mold in the future. However, before throwing that culture away, make sure it actually is mold. Oftentimes a newbie will mistake normal SCOBY formation or a stray tea leaf lodged in the SCOBY as mold. Feeling frustrated, they destroy a perfectly good culture out of ignorance. Molds (or moulds) are fungi that grow in the form of multicellular filaments called hyphae. In contrast, microscopic fungi that grow as single cells are called yeasts. A connected network of these tubular branching hyphae has multiple, genetically identical nuclei and is considered a single organism, referred to as a colony. Molds do not form a specific taxonomic or phylogenetic grouping, but can be found in the divisions Zygomycota, Deuteromycota and Ascomycota. 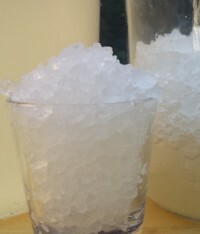 Some molds cause disease or food spoilage, others play an important role in biodegradation or in the production of various foods, beverages, antibiotics and enzymes. 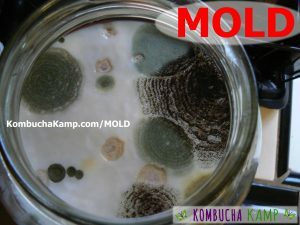 However, the type of mold we are discussing here is definitely to be avoided. 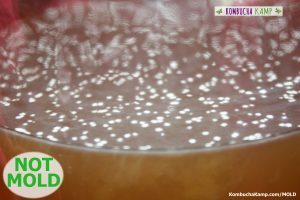 The most typical types of mold that may infest a Kombucha culture are the same as those you would find on bread or fruit or other decaying food items. 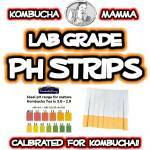 While not deadly, they do produce an off-taste and can cause allergic reactions or sickness. 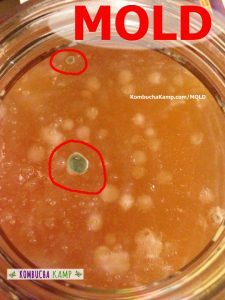 Here are some photos of moldy Kombucha cultures. 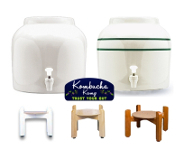 Kombucha mold may grow if the brew is under-acidified or too cold. 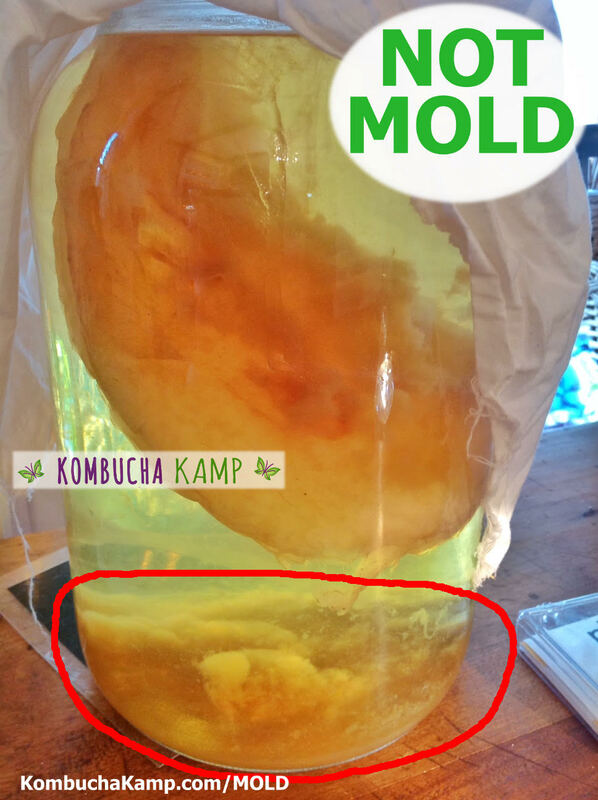 Major case of Kombucha Mold – yech! 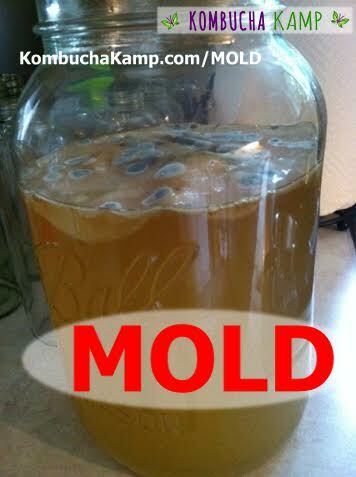 Those blue circles of mold are the problem, while the white circles of SCOBY growth are normal. 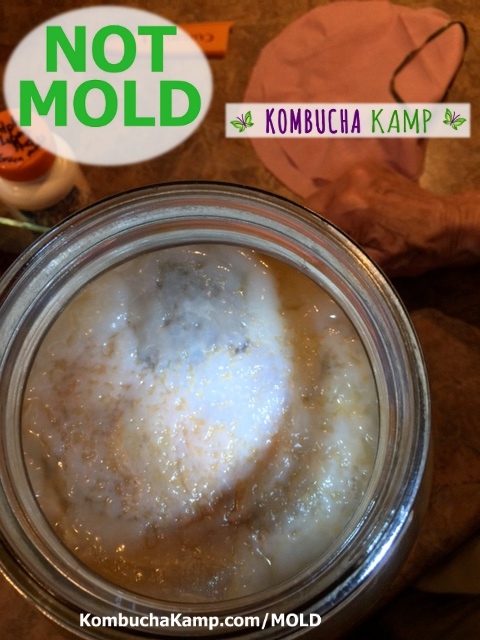 Powdery tan mold covers much of a new SCOBY – mold is always DRY! White fuzzy dry mold is easy to spot. What do you notice about these pics? What color is the mold? Where is the mold located? What texture is the mold? 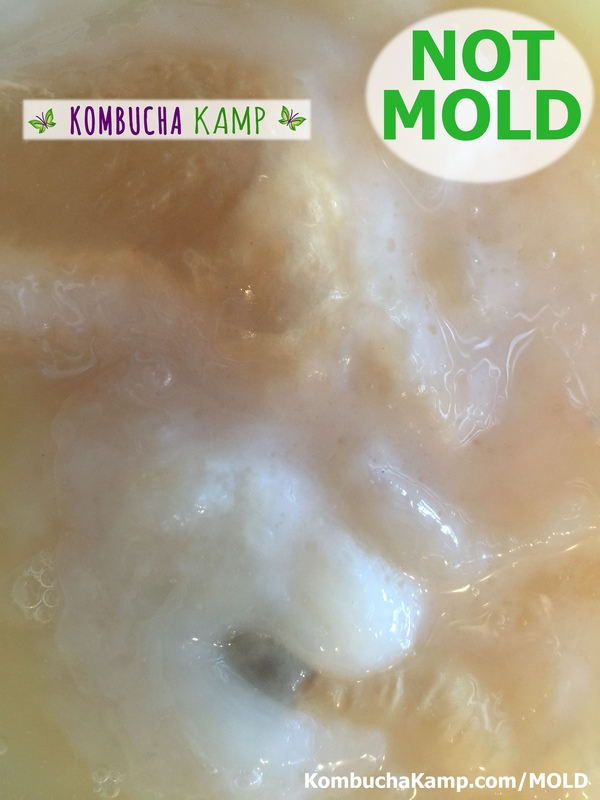 Mold is rare with Kombucha, but if it does appear, all cultures and liquid should be disposed of completely. 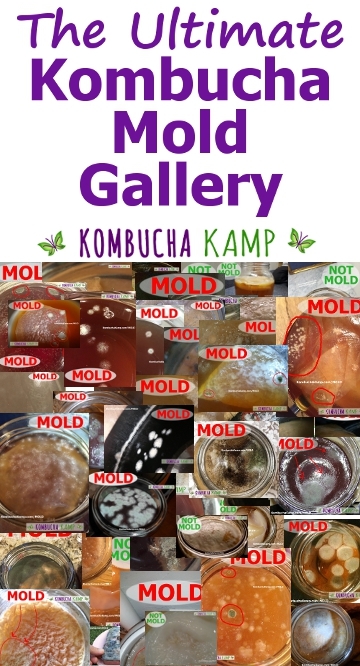 These photo galleries provide examples of actual mold on Kombucha, so review closely before taking action. If you are unsure, you may email us the photo via the contact page. If you see something strange under the liquid, it is likely yeast. If you have any question or doubt, you can always submit a photo via the Contact Page for an opinion. But my SCOBY looks funny! 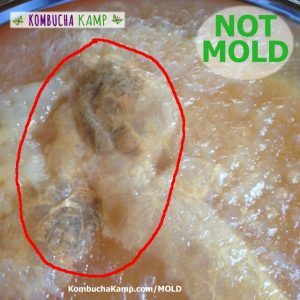 Is it the dreaded Kombucha Mold? Now, just because it is not moldy, that doesn’t mean your SCOBY will form in a perfect smooth pancake. 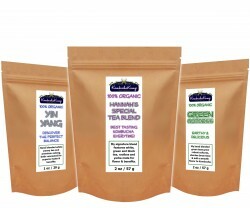 The shape and color of your newly growing cultures is not necessarily indicative of the quality of your brew. 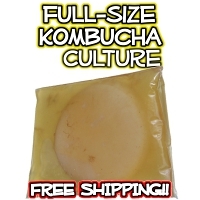 Odd looking cultures can make a fantastic tasting kombucha, and great looking ones can fail. Here are some photos of normal SCOBY formation and yeastie bits (and there are TONS more in the galleries right below!). 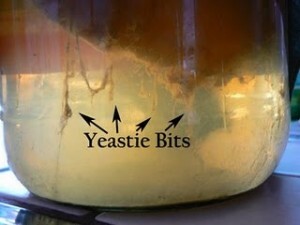 Strands of yeast can embed in the new Kombucha culture as it forms a layer on the brew. Yeast strands are brown and sometimes clumpy, but when underneath the surface can never be mold. 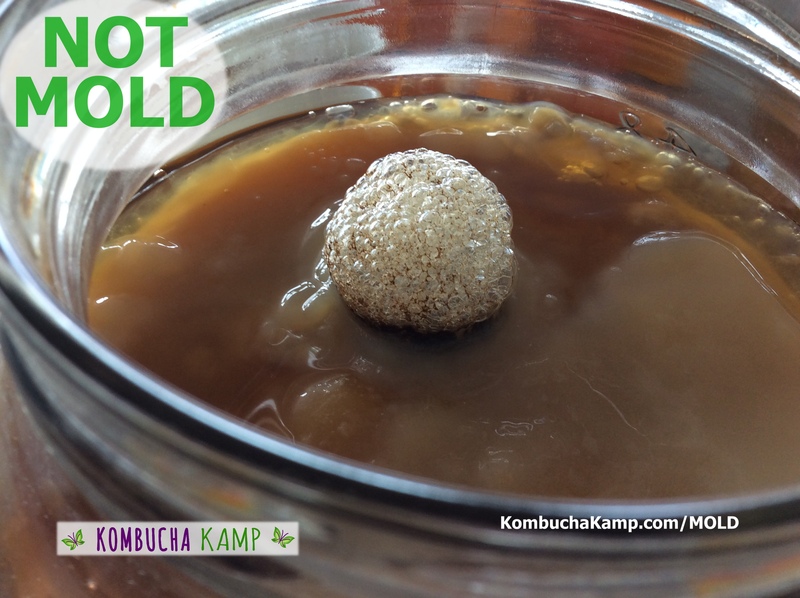 This Kombucha brew may be cold, causing collections of yeast under the new SCOBY growth, but there is no mold. 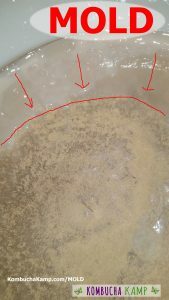 Early SCOBY formation takes a variety of shapes – the many dots will gradually all connect. Click on a photo below to open a gallery with more example images. To the untrained eye, these odd looking formations can seem startling at first, but over time, they become the familiar process of new SCOBY growth. 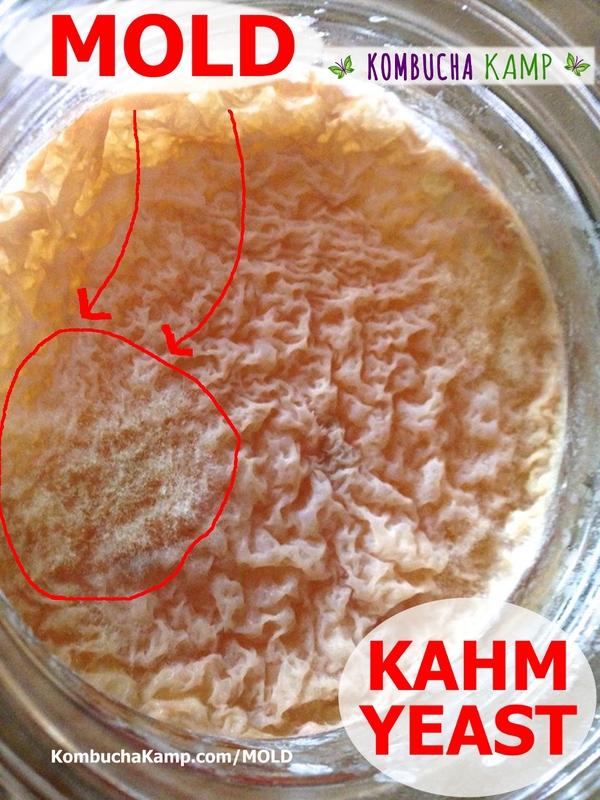 This is why we instruct newbies not to look at or disturb their Kombucha for at least 7 days. 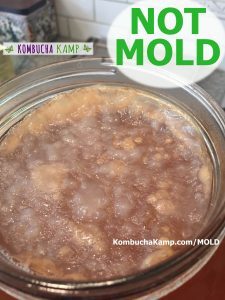 Why does Kombucha Mold occur in the first place? To better understand, let’s review the brewing process. 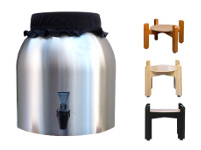 The standard recipe for Kombucha calls for a 90% nutrient solution of sweet tea and 10% Mature KT starter liquid. That starter liquid is the key to protecting the culture from mold. 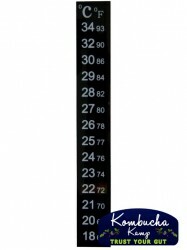 This mature Kombucha Tea has a pH of 3.5-2.5, low enough to create a natural anti-microbial barrier which inhibits the growth of any foreign micro-organisms. 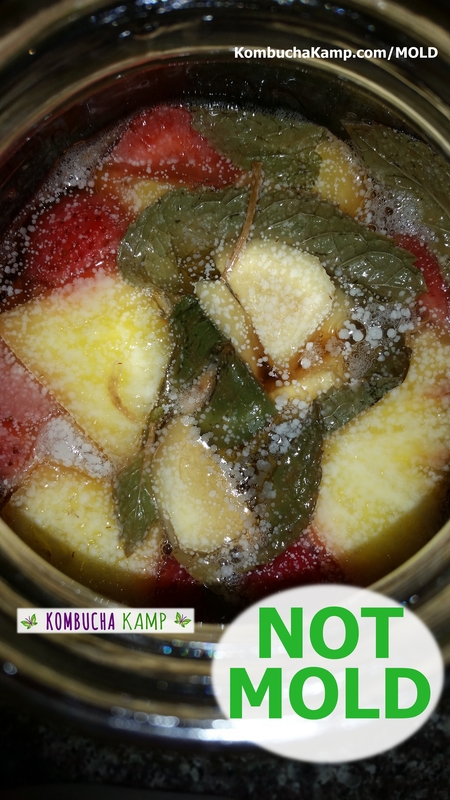 The starter liquid acts as a protective layer until the entire sweet tea mixture is converted to young Kombucha (about 3 days), defined as when the mixture’s pH drops to 3.5 or below. It is only during that approximately 3-day period that there is the potential for mold to grow. Mold spores are not visible to the human eye and can lay dormant or survive in extreme conditions. That is why it is NEVER RECOMMENDED to simply wash off the culture in water or vinegar. 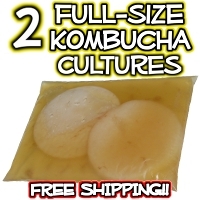 Once again: if you do end up with mold, get rid of your culture along with all other cultures and liquid from that batch and start over fresh from your SCOBY Hotel. 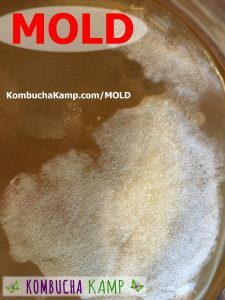 How can I prevent Kombucha Mold? If you find you are getting mold repeatedly, you are in unfortunate rare company. Unfortunately there is likely something in the environment that is contributing to the problem. Is the water clean? If you aren’t sure, boil it without a lid for 10 minutes. 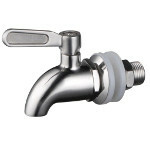 If the vessel has a spigot, it must be removed and sterilized as mold can hide inside. Some other causes for mold include cross-pollination from house plants, cigarette smoke, excessive humidity and cold temperatures (keep cultures out of the fridge!). Over time you will discover that mold is very rare and easy to spot. 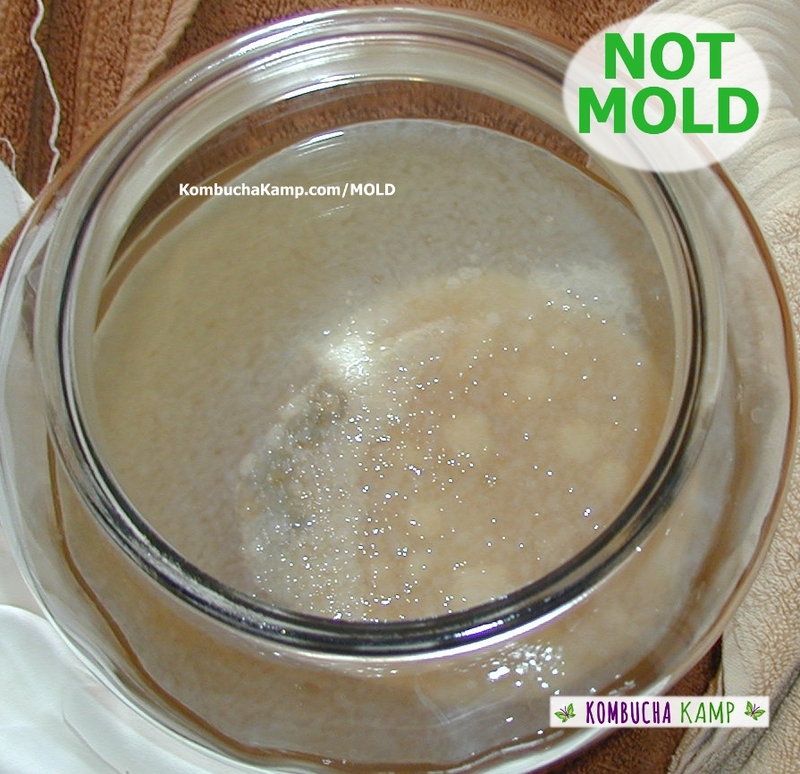 There is definitely no need to fear mold – or new SCOBY formation. The more you observe your culture, the more you will understand its unique process!